Eric Elliott sits in an Oklahoma prison, far away from his family in Ohio. He will spend the rest of his life behind bars, thanks to a two-week odyssey of death and mayhem that began on August 15, 1994 when he met Louis E. Gilbert. Elliott was a troubled young man, but until he met Gilbert, he wasn’t violent. Interestingly, the same could be said about Gilbert. He was a petty thief and ex-con, but had never been trigger-happy until he hooked up with Elliott. The 16-year-old Elliott and the 22-year-old Gilbert met in Newcomerstown, Ohio, birthplace of astronaut Neil Armstrong, but while Armstrong would go on to explore the heavens, Elliott and Gilbert managed only to create a bit of hell on earth. 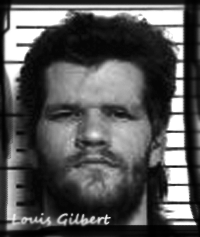 Few people in Newcomerstown liked Gilbert, and few were surprised when he was arrested after his killing spree. They speculated that Elliott tolerated Gilbert because he could buy alcohol. It all started the day Gilbert was released from an Ohio prison for stealing a boat. For some reason, they decided to steal a car and it was all downhill from there. Their first victim was 79-year-old Ruth Lucille Loader of Newcomerstown, who had the car the two men needed to get out of town. Gilbert admitted later on that he shot and killed the 82-pound cancer survivor, whose body was never found despite a massive search by friends and the law enforcement community. Lucy and her late husband had lived in the 12-room farm house on the outskirts of Newcomerstown for more than 50 years and had raised four children there. Her Buick turned up two weeks later, stuck in the mud in Calloway County, Missouri. Like so many other killers, they had followed America’s sewer pipe — I-70 — westward, stopping to wreak havoc and bringing senseless death along for the ride. Elliott and Gilbert abandoned Lucy’s Buick and started walking, eventually stopping at the home of William F. Brewer, age 86, and Flossie Mae Brewer, age 75. After talking with the couple for a half-hour, they forced the couple into the basement of their farmhouse, shot both of them three times in the head, and stole their car, cash, and rifles. The murderers left behind the children of the Brewers, who wondered why two able-bodied young men had to kill when it was just as easy to steal from the elderly couple. William’s cane was found next to his body. A walker was waiting upstairs where he left it. Flossie’s hands had been tied with a phone cord. With California as their goal, the killers headed out again, turning south toward Oklahoma and another date with death. They ended up at Lake Stanley Draper near Norman, Oklahoma where they met Roxy Lynn Ruddell, a 37-year-old unarmed security guard who watched over a marina and whose job perks included all the fishing she wanted to do. She had been married a little over two years when she was murdered, and was working the night-time security guard job to help realize a lifelong dream. Roxy wanted to own a horse ranch one day, and she had a pickup truck the killers wanted. They took it and kidnapped her as they continued their spree. She was shot and her body was dumped a short time later. A motocross rider waiting for his friends to catch up with him found Roxy’s body alongside a trail near the lake. After finding the body, the bikers headed toward the ranger station, but the Brewers’ abandoned car blocked the trail’s exit. Gilbert and Elliott were headed further west with police from three states now on their trail. Two days after Roxy was killed, Gilbert and Elliott were sleeping in a culvert outside Santa Fe, N.M., when state police acting on a tip found them. Two rifles, a shotgun and a pistol were found at their campsite. Family, friends and police from Ohio, Missouri and Oklahoma all wanted a piece of the pair. If it was up to Elliott and Gilbert, they would have opted to head back to Ohio, where they had the best chance of staying alive. In the end, Oklahoma got the first shot at them. Gilbert received the death penalty and Elliott was sentenced to life in prison without parole. Gilbert’s 73 IQ wasn’t low enough to save him from a date with the needle, nor was the fact that his father liked to beat him with a two-by-four. He was executed in 2003. Elliott has never offered any assistance in locating Lucy’s body.